Jeffrey Greene received his MFA from the University of Iowa and his Ph.D from the University of Houston. His most recent book, French Spirits: A House, a Village and a Love Affair in Burgundy, was published by Morrow/HarperCollins. His is also the author of American Spirituals (chosen by Carolyn Kizer for the 1998 Samuel French Morse Prize, Northeastern UP), and a chapbook, Glimpses of the Invisible World in New Haven (1995). He was a winner of the Randall Jarrell Prize and the "Discovery"/The Nation Award and received prizes from The Denver Quarterly and The Southern California Anthology. His work has been supported by the NEA, Connecticut Commission on the Arts, The Vermont Studio Center, and the Mary Rinehart Fund. 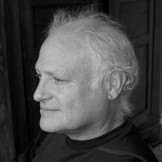 His poems have appeared or are forthcoming in The New Yorker, Poetry, The Nation, Parnassus, The North American Review, The Sewanee Review, Boulevard, American Scholar, The Southwest Review, The Iowa Review, Ploughshares, Columbia, The Southern Review, and many other journals and anthologies.